A strain is when a muscle is stretched too much and tears. It is also called a pulled muscle. A strain is a painful injury. It can be caused by an accident, overusing a muscle, or using a muscle in the wrong way. Apply ice right away to reduce swelling. Wrap the ice in cloth. Do not place ice directly on the skin. Apply ice for 10 to 15 minutes every 1 hour for the first day and every 3 to 4 hours after that. Use ice for the first 3 days. After 3 days, either heat or ice may be helpful if you still have pain. Rest the pulled muscle for at least a day. If possible, keep the pulled muscle raised above your heart. 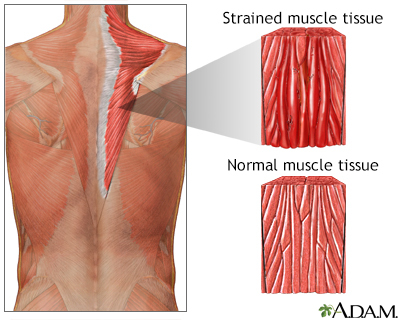 Try not to use a strained muscle while it is still painful. When the pain starts to go away, you can slowly increase activity by gently stretching the injured muscle. You are unable to move the muscle. Call your health care provider if the pain does not go away after several weeks. Warm-up properly before exercise and sports. Keep your muscles strong and flexible. Nakamura N, Rodeo SA, Alini M, Maher S, Madry H, Erggelet C. Physiology and pathophysiology of musculoskeletal tissues. In: Miller MD, Thompson SR, eds. DeLee & Drez's Orthopaedic Sports Medicine. 4th ed. Philadelphia, PA: Elsevier Saunders; 2015:chap 1.